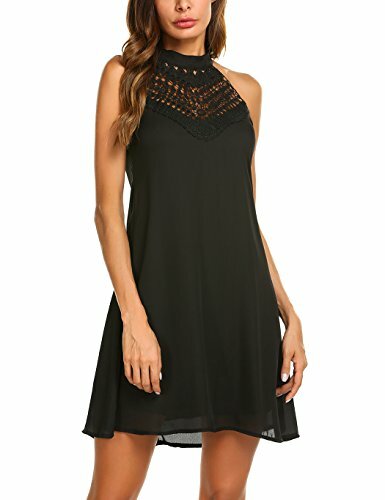 Sweetnight Womens Halter Neck Chiffon Tunic Tank Dress T Shirt Dresses (Black, M) by Sweetnight at SCRHI. MPN: 4X0854063005. Hurry! Limited time offer. Offer valid only while supplies last. Material: 100% Polyester with no stretch. Washing:Cool hand wash,and hang to dry.Do not bleach,dry clean or tumble dry.Low iron if necessary. Design:Starting at a hlater neckline and slopping into wide arm opening;Shift shape dress ends in a scalloped eyelash lace hem;Back keyhole closes with two buttons;Invisible zipper in the back. Suit for casual outdoor,cocktail,special occasion,banquet,wedding,party,evening. Undergarments:May be worn with an adhesive bra,petals,or no bra. If you have any questions about this product by Sweetnight, contact us by completing and submitting the form below. If you are looking for a specif part number, please include it with your message.